Citation: C N Trueman "Gustavus Adolphus"
Gustavus Adolphus lead Sweden during her glory years in the Thirty Years War. However, Gustavus was also responsible for many domestic reforms which pushed Sweden from being just another Baltic state to being the most dominant power in the region. His achievements must surely have inspired Peter the Great to do the same for Russia. 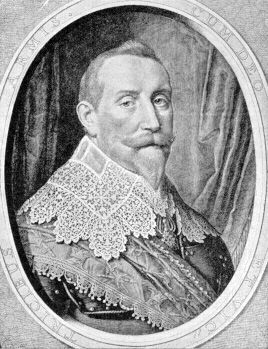 Gustavus Adolphus has been described by E N Williams as “the greatest Swedish King and one of the greatest statesman in European History”. Gustavus became king in 1611 and ruled until his death in battle in 1632. His parents were Charles IX and Christina of Holstein. Gustavus married Maria Eleonora, the daughter of Elector John Sigismund of Brandenburg. The marriage produced one daughter, Christina. Gustavus Adolphus became king of Sweden in 1611 when he was just 17. His youth could have been a major weakness as the nobility could have exploited this to their advantage. However, Gustavus had been tutored by Johan Skytte and he had ensured that the young prince had developed the necessary attributes when dealing with people. Gustavus was highly intelligent and well versed in the Classics, Law, History and Theology. He was fluent in German and spoke a number of foreign languages very well. From the age of 10 he had attended council meetings so by the age of 17 he had a formidable knowledge about affairs of state. He also had a natural ability to lead soldiers. He taught himself about the use of modern artillery, logistics, military organisation and strategy. He learned a great deal from Maurice of Nassau but Gustavus was also an innovator of change. Gustavus worked himself very hard; he was a deeply religious man and a good orator. To add to these attributes, he also had immense physical presence. In 1611, Sweden was a weak country both a home and abroad. As he was so young when he became king, the Riksrad (the chief council of the nobility) tried to re-assert itself as Charles IX had done a great deal to erode their power. In January 1611, Gustavus Adolphus was forced to accept the Accession Charter in which he agreed to give chief offices only to men from the high nobility and to conduct all his policies in consultation with the Riksrad. This humiliating experience for Gustavus did not usher in a period of noble control in Sweden. Gustavus’ reign is, in fact, characterised by the harmonious relationship Gustavus had with the nobility as was symbolised by the friendship he had with the leader of the high nobility, Axel Oxenstierna. The king also enjoyed popular support among the common people. They were represented in the Riksdag (the Diet) where they had the right to express their opinions, so issues like conscription did not cause instability. Gustavus Adolphus was a rarity in the Seventeenth Century – a powerful monarch supported by all sections of society. At home, Gustavus and Oxenstierna introduced major reforms which had a marked impact on Sweden.